The Latin name juglans is derived from the Latin Jovis glans, meaning ‘nut of Jupiter’ or ‘nut of the gods.’ This stems from the belief that the gods ate these superior nuts. The walnut tree, belonging to the juglandaceae plant family, grows all over the world in places like North and South America, Europe, Asia and has also been cultivated in England. We buy ours from the USA and Italy. The large walnut tree can grow up to 100 ft high and 12ft in diameter. When the nuts are ripe, they can be picked and cold-pressed to create walnut oil. In some countries, this is used as cooking oil. Walnut oil is vitamin rich and moisturising, as well as an antiseptic, and said to help with many dry skin conditions. Walnuts were often tossed at Roman weddings, as they believed that they protected against disease and brought good health. Walnut leaves and husks were the main source of brown hair dyes until the 20th century. We buy our powdered walnut leaves in Europe. 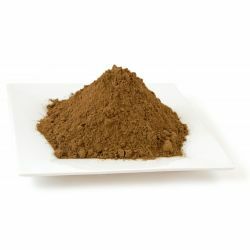 Powdered walnut leaf is produced from grinding the dried cut leaves of the walnut tree, yielding a green-brown powder with a mild yet spicy odour. It carries much the same properties as the walnut oil. Our T for Toes foot powder contains powdered walnut leaf for its antiseptic qualities to keep the feet sweet smelling.